Windows Phone 8.1 on a budget. Microsoft unveiled the Lumia 535 - its first Lumia device without the Nokia branding - back in November without confirming release dates for the US and the UK. Now we know when British buyers can get their hands on the smartphone: today. The headline features of the affordable handset are a quad-core 1.2GHz Snapdragon 200 processor, 1GB of RAM and 5-megapixel cameras on the front and the back of the device. The 5-inch display runs at a qHD (960 x 540) resolution and Windows Phone 8.1 is pre-installed. Microsoft doesn't name a retail price but it's up for £89.95 (roughly $135, AU$173) on Amazon. You can also pick up the handset from Tesco, O2, Carphone Warehouse or Virgin, with Microsoft promising to add "additional sales channels" in the weeks ahead. If you're eager to taste the latest that Windows Phone 8.1 can offer (complete with the most recent Denim update) and you don't have a lot to spend then the Lumia 535 fits the bill perfectly. All the usual WP goodies are included, such as Office, Skype and OneDrive. 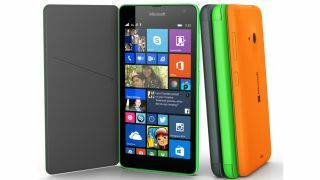 The handset maker says that the new phone is going to be available in a range of Lumia-esque colours, including green, orange, white, dark grey, cyan and black, so you'll be able to shop around to find something that suits your tastes. Like the rest of us, Microsoft is gearing up for the full launch of Windows 10 (rumoured to be scheduled for late 2015) but the Redmond company has said that all WP 8.1 handsets will get the Windows 10 upgrade when the time comes.